My latest Japan Times Japanese Kitchen column is about bitter gourd or bitter melon, which is a major part of Okinawan cuisine along with tofu, pork, and other things. 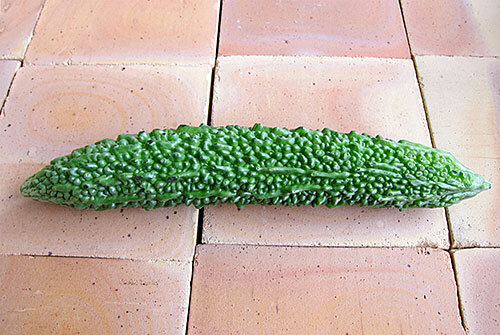 As I explain in the article, while the most common Japanese name for this rather ugly vegetable is nigauri (苦瓜), since it's so closely associated with Okinawan cooking it's often called by goya or go-ya- too, its Okinawan name. Bitter gourd is really, well, bitter, making it almost inedible, especially if you're new to it. However, it is really good for you, and like other acquired tastes, once you get used to the bitterness you almost start to crave it. But in the meantime, if you want to try using bitter gourd in various recipes (it goes particularly well in stir-fries and curries and such) try one of the two methods described in the article: blanching, or massaging with salt and soaking for a while in a bowl of water. I use the blanching method, although the salt and soaking method works for me too, since The Guy has not yet conquered his bitterness resistance (although it's getting there). Cut the gourd open in the middle. Scoop out all the pithy parts and the seeds, completely. This is important since the pith is extremely bitter. A teaspoon is the best tool for this task. Slice up the gourd, Put into a pan, and cover with water. Add a little salt, and bring to a boil. Boil for a minute (you just want to blanch it really) and drain. 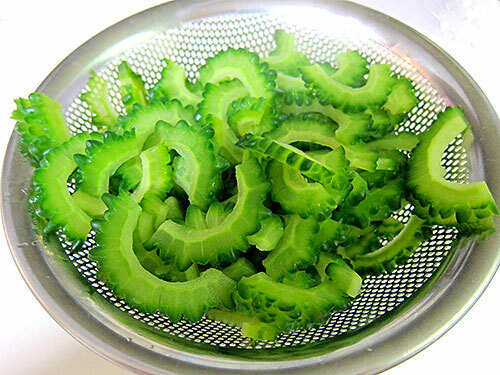 The slices will turn a beautiful bright green. Now you can use it in whatever dish you like, such as this classic Okinawan staple, goya chanpuru (or champuru). This is really classical Okinawan home cooking, so there are probably as many variations as there are households in Okinawa. This is a very simple version. I think the sesame oil is the key here. Slice and pre-treat the bitter gourd as described above to get rid of much of the bitterness. Take the tofu out of the packet and drain off all the water. Wrap in a couple of layers of paper towels (or an impeccably clean cloth kitchen towel). Press on both sides with your hands to squeeze out some water. Unwrap and cut into large-ish cubes. Lightly season the pork slices with salt and pepper. Beat the egg with a little salt and pepper. Heat up a wok or frying pan with the sesame oil. Add the pork, and stir fry until it turns pale and starts to brown a little. Add the bitter gourd and tofu and continue stir frying. Water will come out of the tofu and bitter gourd, so stir fry over high heat to evaporate it, as well as to brown the tofu and the pork. Add the soup granules and soy sauce and stir it around. Push everything to one side of the pan. Pour in the beaten egg and scramble it quickly. Mix it in with the other ingredients. Taste, and add more salt and/or pepper if needed. 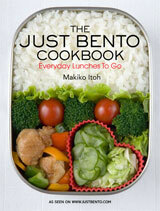 Serve as-is, or sprinkled with sesame seeds and/or bonito flakes. Drizzle on some extra sesame oil or ra-yu (sesame oil with chilis in it) to finish for even more flavor. Using Spam instead of the pork belly is very popular, but I...just can't become fond of Spam. What is good though is using bacon instead of the pork belly. After all, what is bacon but cured pork belly? Just stir fry it until it's just about crispy, and proceed. There's no need to season the bacon of course. Adding some miso dissolved in a bit of water at the end is nice too. Try about 3 tablespoons of miso of your choice with a teaspoon of sugar, loosened up with about a tablespoon of water. For a spicy variation, use gochujang instead or mixed with miso. Please be aware that the bitter gourd will still be bitter after all the pre-treatment and the stir frying, but...after a while, it really does become addictive! Submitted by maki on 2013-07-26 14:40. Lovely recipe! I've found that goya's bitterness is well-balanced by Japanese rice. I usually just slice the goya, salt it well and let it sit for up to an hour then rinse it several times in cold water and squeeze as much of the liquid out as possible to prepare it. The feeling I get from eating goya is similar to drinking a cold glass of unsweetened grapefruit juice in the summer heat; something about that bitterness is very refreshing! 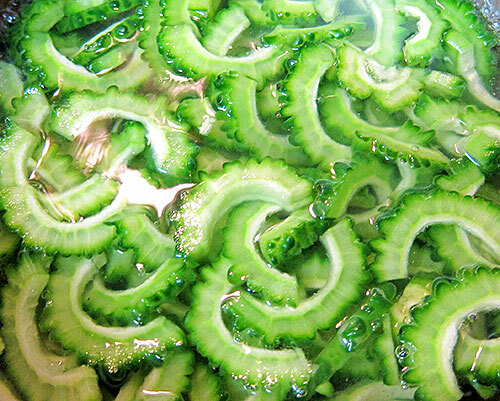 The green of the blanched slices is so intense! I've used this vegetable once before in a Thai soup recipe, and managed to eat it, but didn't find myself craving it later. It's REALLY bitter. My father is very fond of the bitter melon. I think his fondness started from the so-called medical benefits (whether it be scientifically proven or not). And every time he had bitter melon, we, the kids, would have to try some too. It was torture! A few years ago, I tried cooking a bitter melon recipe using quite a sweet sauce with beef, alas the dish was still too bitter to me (I ended up eating just the beef). But maybe the tip about blanching it first in salt water would help? Oh, I love Goya Chanpuru! Thanks for the recipe, I'll definitely try it out. 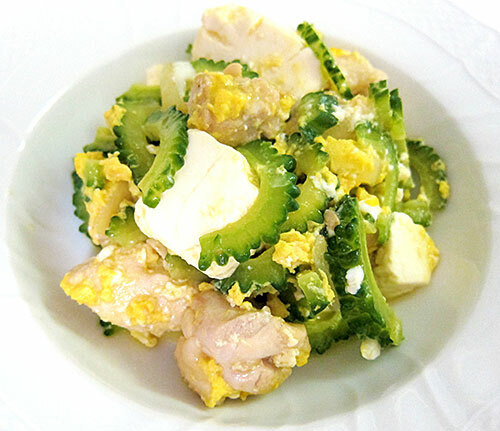 I live in Bali - Indonesia and we called the Goya: "Pare"
So happy that you posted this recipe! I have just returned from a trip to Japan and I went to an Okinawan restaurant serving this exact dish! I can't wait to try this on my blog, using the miso variation that you included. Thank you so much for sharing, since I now belong to the crew that finds that bitterness totally addictive! On a hot day I love using a wasabi/fine daikon grater and getting a little goya juice/pulp to add to drinks. Tonic Water has always been one of my favourite beverages so Goya juice and sparkling water isn't such a shock and I can control how much sugar I add, if any. Just like with shiso, goya seems to noticeably improve the appetite when the temperature rises. plenty in asian indian shop and also the frozen ones available in indian asian shop and tesco too throughout the year. It DOES look like a child of Godzilla! It's not just you. I never noticed this before. 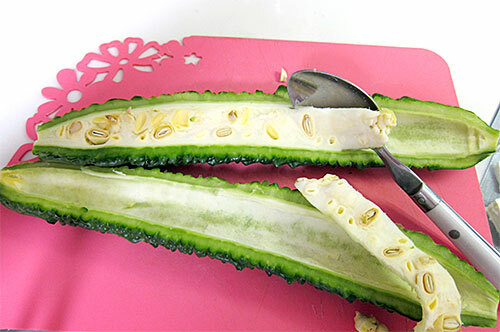 This recipe really makes me want to take up cooking with bitter melon again. One really fantastic and simple way to prepare it is slice it very thin with a food processor and deep fry it in ghee or oil until it's light brown. Drain and sprinkle with salt and pepper and eat as a side dish or snack, like potato chips. Cooked this way it truly is addictive. that's really interesting - the indians use this gourd as well (kerela) while the Chinese use bitter melon which is a lighter green, a bit smoother, and a bit less bitter! Thanks for the recipe. Received a bag of these and just finished eating this for the second time in three days. Hub wanted 豆板醤 on it and it was perfect for lunch on a heat wave day. My parents are from Okinawa and they eat a lot of goya. My mom even grows the beautiful gigantic goya vine in their yard in Argentina. I live in New Jersey, and found it at the Indian grocery store. Bought a couple of them (they are much smaller than the Chinese or Japanese kind), cooked them (I didn't pretreat them) and surprisingly, my husband loved them! I'll try this recipe tonight. Thanks for posting it, Maki! This is a beautiful dish loaded with health benefits. We've tried it in various places but somehow, can't seem to find it in the Japanese restaurants in Phnom Penh, Cambodia. I heard a lot about it that like other acquired tastes, once you get used to the bitterness you almost start to crave it. But that’s not the case for me. I simply don’t like bitter gourd right from beginning.